A 16-year-old Palestinian girl was shot by Israeli forces in the West Bank after reportedly attempting a car ramming attack on Israeli soldiers. The teen remains in a critical condition. The incident took place at the Gush Etzion junction Wednesday in the occupied West Bank, near Bethlehem. According to an Israeli army spokesperson, Fatima Jibrin Taqatqa attempted to drive into a group of soldiers at a bus stop at a junction where civilians were also standing. No Israelis were injured, but a pregnant woman was taken to hospital after she experienced a panic attack, the Magen David Adom ambulance service said. “Responding to the imminent threat, security forces shot and wounded the attacker," an Israeli army spokesperson told Maan News Agency. Video footage of the incident shows a car crossing lanes at speed, and driving towards a group of people at the opposite side of the road. The car then crashes into metal bollards in front of the bus stop. It’s unclear at what stage the teenager was shot. 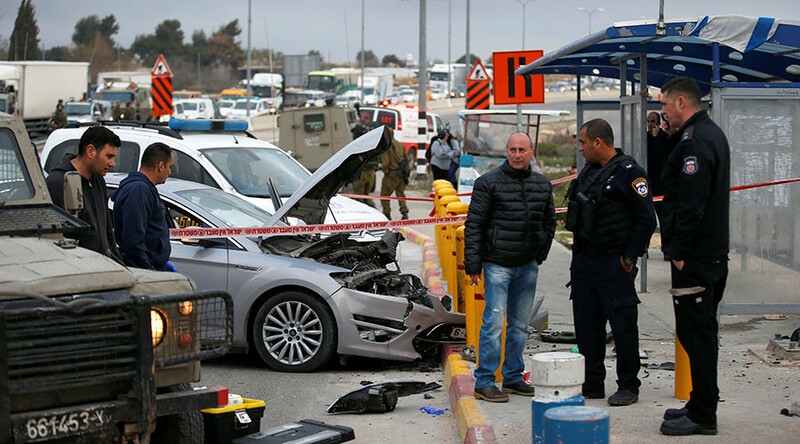 The Jewish Press reports IDF soldiers stationed at the site immediately opened fire, with video footage obtained by the Times of Israel showing officers pointing machine guns at the car after it has crashed. Initial reports suggested Taqata, from Beit Fajjar, South of Bethlehem, had been killed, but it’s now understood the teen was taken to hospital and remains in a critical condition after suffering gunshot wounds to the head, Alaqsa Voice reports. According to Palestinian media, Israeli forces reportedly closed all entrances to Beit Fajjar after the incident, and arrested the girl’s cousin, Amjad Taqatqa, at the main entrance. The Etzion Junction bus stop has been the scene of other car rammings and shootings.